Our printing unit is equipped with large format offset printing machines from KBA, Germany. A single large format KBA RAPIDA 105 offset machine can print about 12000 sheets per hour. Each sheet holds almost 110 cards of Poker size. Our coating machines can handle the same format sheet sizes at a speed of about 12000 sheets per hour. The automatic punching machines that complete the cutting/collating process can handle almost all production of the printing machines on a day to day basis. Different card sizes require different setups on the cutting machines. Cutting of cards and collating the same is done automatically. Our cutting collating machines allow us to gather cards starting from the smallest size going up to the Jumbo card size that you may need. Our skilled staff makes it a point that most of the production is completed on schedule. Running to double shift at the production plant, we have the capacities to complete any complex production job within record time. This is made possible by the staff members as each stage of the job is detailed to every department before the job goes into production. 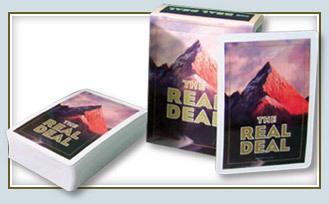 We make card games for clients across the world with customer specific artworks. Working with us, you will find that we are closer to you than the manufacturer next door. We may be oceans apart, but our feedback and response is quicker than what you may expect. At The Ace Card Company, the pre-press department makes it a point to forward all proofs within 2 working days of receiving artworks, for client approvals. Once approved, we make sure that the job goes to press within the next 72 hrs. With proper curing time given to the printed sheets, these are further moved to aqueous coating and UV coating as per clients specifications and the next stage of production starts within 2 working days. Packaging of games of all type are taken care of by another department that makes sure that the tuck boxes, display boxes and game instruction sheets or booklets and cello wrapping processes are ready before the cards come for assembly. Further quality checks at assembly allow us to ship goods that are perfect in every aspect. The full production process is completed in-house. We request for a lead time of one month, but all job orders normally complete within 3 weeks time. As we are just 20 kilometres away from the International Airport, thus air shipments can be shipped even at a short notice, to any destination across the world. Our tie up with the most reputed shipping lines ensure that your products reach you on time, anywhere across the world. All shipments leave the factory warehouse fully insured up to your city CFS. All tuck boxes, inner boxes, inner master cartons, outer cartons, outer master cartons are made up of export worthy materials. This ensures that no sea shipment is effected by any change in the climatic conditions during the shipping period. We will make sure that all our customers receive the quality that they expect from our company. For we want to be known as the best across the world.